Justice Chuka Obiozor, who gave the ruling, also ordered that the sums of $2.7 million and N84.5 million, realised as rents on the property, should equally be forfeited to the Federal Government. A Federal High Court in Lagos on Monday ordered permanent forfeiture of a $37.5 million sky-scrapper on the highbrow Banana Island, Lagos, belonging to former Minister of Petroleum Resources, Diezani Alison-Madueke, to the Federal Government. Obiozor, a professor of law, gave the orders following a motion on notice argued by the Economic and Financial Crimes Commission’s counsel. 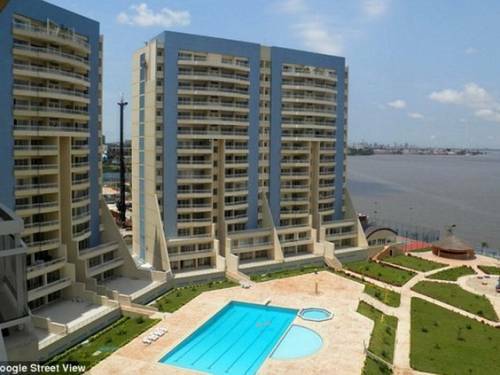 The anti-graft agency had on July 19 obtained a court order to temporarily seize the property located at Building 3, Block B, Bella Vista Plot 1, Zone N, Federal Government Layout, Banana Island Foreshore Estate which is said to have 24 apartments, 18 flats and six penthouses. The court had directed that the temporary forfeiture order be published in a newspaper and fixed August 7 to enable anyone interested in the property and funds to appear to convince the court why they should not be permanently forfeited to the Federal Government. At the hearing of the case on Monday, the EFCC lawyer, Anselem Ozioko, told the court that the publication order had been complied with and said no one had contested the forfeiture order. He urged Justice Obiozor to go ahead and order the permanent forfeiture of the property and the funds. The EFCC had earlier told the judge that the Banana Island mansion was reasonably suspected to have been acquired with proceeds of unlawful activities by Diezani. The anti-graft agency said its investigations revealed that Diezani purchased the property sometime in 2013 at a cost of $37.5 million, for which she paid in cash. According to the EFCC, the $37.5 million was moved straight from Diezani’s house in Abuja and paid into the seller’s First Bank account in Abuja. Ozioko said: “Nothing could be more suspicious than someone keeping such huge amounts in her apartment. Why was she doing that? To avoid attention. In a 41-paragraph affidavit attached to the application, an investigative officer with the EFCC, Abdulrasheed Bawa, explained that Diezani in connivance with one Nwokedi purposely incorporated a company, Rusimpex Limited, on September 11, 2013 to facilitate the alleged fraud scheme. Bawa said Nwokedi later registered Rusimpex Limited at the Corporate Affairs Commission, wherein a lawyer in his law firm and a Russian, Vladmir Jourauleu, were listed as the directors of the company. The investigator explained further that sometime in 2013, Alison-Madueke invited Nwokedi to her house in Abuja for a meeting, where she informed him to incorporate a company and use same as a front to manage landed properties on her behalf without using her name in any of the documents. Diezani was also said to have further directed Nwokedi to meet with Bisi Stephen Onasanya, the Group Managing Director of First Bank of Nigeria Plc, for that purpose. Bawa said: “Stephen Onasanya was invited by the commission and he came and volunteered an extra-judicial statement wherein he stated that he marketed a property at Bella Vista, Banana Island, Ikoyi, Lagos, belonging to Youseff Fattau of Ibatex Nigeria Ltd to Diezani Alison-Madueke and she later bought the property from Youseff Fattau, through Nwokedi (who she introduced to him) and that the payment for the said property was made through the Abuja office of First Bank. “First Bank of Nigeria Plc, through Barau Muazu, wrote to the commission and also volunteered an extrajudicial statement in writing that they made the payments totalling $37.5 million to Ibatex Nigeria Ltd and YF Construction Development and Real Estate Ltd on behalf of Diezani Alison-Madueke.